Alton Meyer was born in 1938 in Fredericksburg, Texas. He was commissioned through the Air Force ROTC program at Texas A&M University on July 15, 1960, and went on active duty beginning August 7, 1960. Lt Meyer attended pilot training at Moore AFB, Texas, and Vance AFB, Oklahoma, from August 1960 to June 1961, and then entered Undergraduate Navigator Training in August 1961, earning his navigator wings at James Connally AFB, Texas, in May 1962. 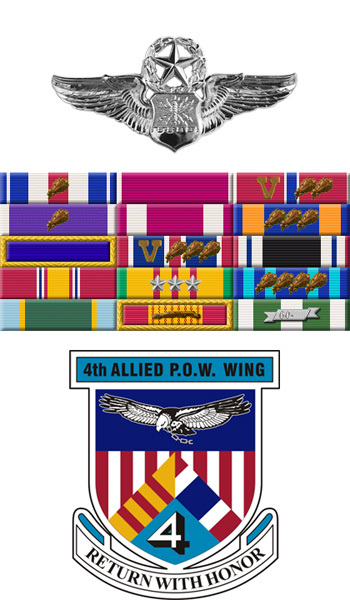 He next completed Electronic Warfare Officer (EWO) training at Mather AFB, California, in May 1963, followed by survival training at Stead AFB, Nevada, and then service as an EWO with the 4758th Defense Systems Evaluation Squadron at Biggs AFB, Texas, from June 1963 to February 1966. Capt Meyer's next assignment was as an EWO with the 29th Air Division at Duluth International Airport, Minnesota, from February to December 1966, and then as an F-105F Wild Weasel EWO with the 333rd Tactical Fighter Squadron at Takhli Royal Thai AFB, Thailand, from January 1967 until he was forced to eject over North Vietnam and was taken as a Prisoner of War on April 26, 1967. After spending 2,140 days in captivity, Maj Meyer was released during Operation Homecoming on March 4, 1973. He was briefly hospitalized to recover from his injuries at Lackland AFB, Texas, and then received an Air Force Institute of Technology assignment to complete his master's degree at Texas A&M University from September 1973 to August 1975. After completing RF-4C Phantom II Combat Crew Training, Col Meyer's final assignment was as an RF-4C pilot with the 12th and 91st Tactical Reconnaissance Squadrons and on the staff of the 67th Tactical Reconnaissance Wing at Bergstrom AFB, Texas, from February 1976 until he retired from the Air Force on December 31, 1980. 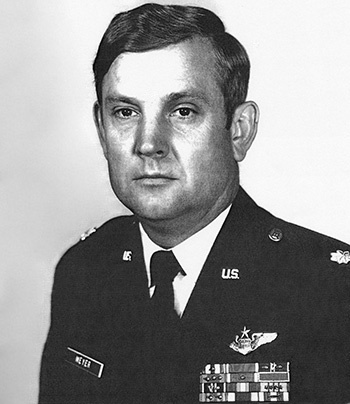 Captain Alton B. Meyer distinguished himself by gallantry in connection with military operations against an opposing armed force as an F-105F Electronic Warfare Officer near Hanoi, North Vietnam on 26 April 1967. On that date, Captain Meyer was assigned the task of suppressing surface-to-air missile sites. In spite of heavy defenses and constant threat to his aircraft and in complete disregard for his own personal safety, Captain Meyer gave directional information and missile warnings to his pilot while they attacked a threatening missile site. His gallant efforts succeeded in enabling the strike force to destroy the target without suffering any losses. By his gallantry and devotion to duty, Captain Meyer has reflected great credit upon himself and the United States Air Force.